The supervisor can define programs which will be blocked while TimeWatcher is running. This feature is useful to control which software is used on the computers in your business. Another use is to prevent that the customers open programs to tamper with the settings of their terminal. Another protection function of TimeWatcher is the enabling of restrictions, which are offered by the Windows Operating system. 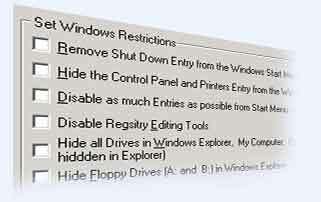 It for example possible to hide entries in the Start menu and disable the Windows Control panel or the Registry editing tools. Additional security is provided by the special TimeWatcher security check dialog which is displayed, if an authentification from an user is needed. To make sure that no unauthorized person can read the TimeWatcher password from the typing fingers of the supervisor, a new security method was invented. Instead of using the same password every time the supervisor can make use of a security formula. This formula is used to calculate a security code, which changes every time. This procedure is much easier than expected as the following example shows: A security formula of the supervisor is for example "ABC". 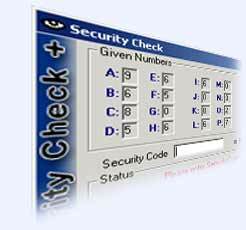 On the right a typical security dialog is shown, which contains 26 randomly generated numbers for the letters A-Z. With the security formula ABC the correct security code would be the number at A (=9), the number at B (=6) and the number at C (=8), which makes 968. After a short learning period, this system is easier to use than passwords and a lot more secure.